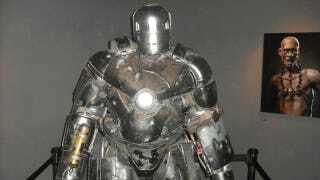 This life-size, old school Iron Man armor was on display last night at LA's Gnomon Gallery, alongside props and concept art from Avatar, the Iron Man movies, Pirates of the Caribbean: On Stranger Tides, I Am Number Four, and more. We headed to the gallery, located on the campus of the Gnomon School of Visual Effects, in order to check out what was on offer at the exhibition, entitled "The Art of Legacy Effects," and the entire exhibition was a showcase for the company's various artists. While some of the prop designs more or less ended up in the finished film, a lot of the concept art represents a radically different vision from what ended up on screen. We've got a full set of photos showing the various pieces on display in the gallery on the left, and we also took the chance to talk with a couple of the people behind the exhibition. We spoke with Alex Alvarez, who founded the Gnomon School back in 1997. He explained that the school began as a way for people from various studios to teach each other about 3D effects - something that was at the time still in its infancy - but has since expanded into a more general school for students wanting to work in animation and visual effects. We also talked about the Gnomon School last year; here's our earlier post. The gallery, Alvarez explained, was started back around 2008 in order to showcase a type of art that wasn't really being shown elsewhere. He said that he could go to other galleries and see art of both the highbrow and lowbrow (hey, it is LA) varieties, but there was nowhere one could go to see entertainment art. Exhibitions like this give people a chance to see concept art that they otherwise likely would never encounter - other than the pieces for Iron Man and Avatar, pretty much everything there ended up not being used in the finished films. We also chatted with Legacy Effects artist Scott Patton, whose concept art for movies like Pirates of the Caribbean: On Stranger Tides formed a big part of the exhibition. He talked a little bit about the vagaries of developing concept art for big blockbusters, saying that he often only has a couple lines from the entire script to work with. He said that, while the finished products will almost certainly be digital effects, practical sculpture is also an essential part of the creative process. He also offered some insight into the collaborative process between artists and directors. He explained that some directors take the phrase "concept art" literally, not wanting anything much more detailed than a basic sketch when they're still trying to work out their own vision for the movie. Other directors - and he named Steven Spielberg and James Cameron as examples of this - love to see concept art that is more or less finished because it can help them figure out the endgame for the movie. Patton says that suits him better, because he prefers to approach his concept art as something that is working towards a finished vision for the movie. For more on the Gnomon Gallery, go here.